Pole is an intervention in an existing space and alters the functionality of it. The appearance is based upon the phenomena of an acoustic lens or disc. In its focus, in front of the hollow shape, a four-channel loudspeaker and microphone system is located. A computer controls and regulates a process of audio feedback. At the exhibition venue, a hollow, 20 square meters, disc-shaped structure almost covered one of the walls in a former office space (the “Timmerfabriek” from 1905). The alien structure was made from wood, styrofoam and plaster and paint in exactly the same shade as the original paint on the walls, integrating it with the existing room. The focal point of the disc was located just in front of the opposite wall, where a set-up with a computer, four active speakers and four microphones on a tripod was placed. Sonic feedback was established by a connection between one microphone and one loudspeaker at the time. These items were both directed towards each other via the disc’s reflection. The exact distance in between speaker and microphone induced a particular range of tonal sounds. A custom-made application on the computer, an assignable sequencer, controlled which of the four microphones would connect with one of the four loudspeakers. And because the distances between them varied, a shift in tonal ranges became audible. In addition to this, another application suppressed clear (louder) tones, when these would take over the resulting sound. (Actually, this was a ‘feedback-destroyer’ using frequency-trackers and notch-filters). A big inspiration was, among others, the military pre-radar “acoustic mirrors” along the British coastline. Those enormous concrete parabolic shapes were meant to hear the approach of (hostile) boats and planes over a vast distance. As technology developed, the parabolic shape made electro-magnetic forms of communication possible: to space, or from country to country. Now, as it has become an icon for mass media, it expresses an urge to look at and listen to what is happening elsewhere. The operational area of Pole is limited to the given space only; the producer as well as the consumer share the focus. Consequently, sound has become an inevitable part of the architecture. Wooden construction and stucco, tripod, Mac Mini (software: Reaktor), 6-channel microphone and speakersystem. 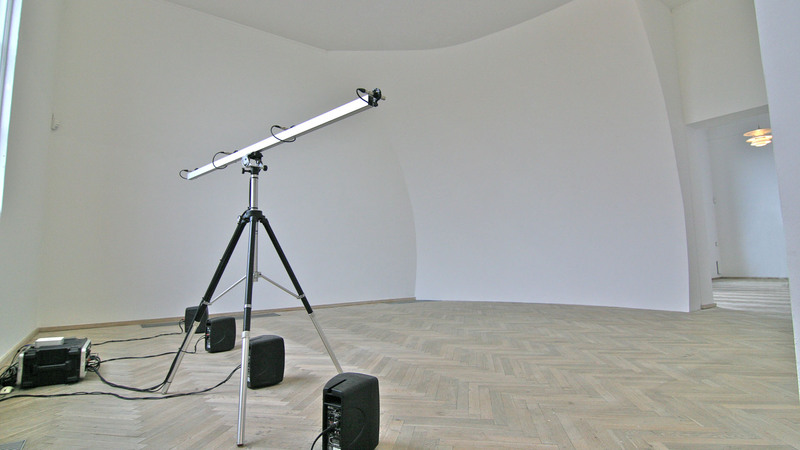 2008 - 2010 'Glocal Affairs', Timmerfabriek, Maastricht, 'Forårsudstillingen', Kunsthal Charlottenborg, Copenhagen.